Shirts With Random Triangles: Texas A&M adds four-star athlete prospect Christian Harris to its 2019 football recruiting class. Harris is the younger brother of former Wake Forest defensive end Tylor Harris. 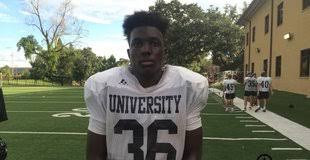 247Sports grades Harris as a composite four-star athlete prospect. The recruitig site’s composite prospect rankings for 2019 rank Harris at no. 20 among athlete prospects, at no. 6 among prospects from the state of Louisiana, and at no. 132 nationally. Harris attends University Lab High School in Baton Rouge, La. He stands 6’1, and weighs 225 lbs.